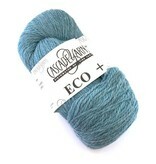 Cascade Yarns Eco+ is a 100% non-superwash wool yarn. This durable bulky weight yarn is a great option for all things garments. It achieves fantastic stitch definition making it a wonderful yarn for cables and textured stitches. Available in a wide range of colors from neutrals to brights. With a generous putup of 478 yards per hank, you'll only need a few skeins for a sweater.